Hawaii Gov. David Ige issued a call for unity after he was sworn in Monday at the Capitol for a second four-year term. Ige’s statement seemed a nod to the fact that top leaders in the Hawaii state Senate and House of Representatives openly campaigned for his 2018 Democratic primary opponent, U.S. Rep. Colleen Hanabusa. But Ige, a little-known state senator just four years ago, handily defeated Hanabusa and went on to crush Republican Andria Tupola by a landslide in the general election. 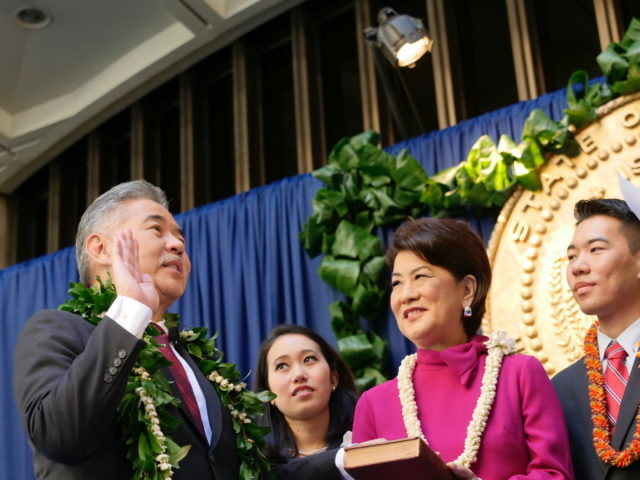 David Ige takes the oath of office with his daughter Amy, wife Dawn Ige-Amano and son Matt at his side during a noon ceremony Monday at the Capitol. Ige was sworn in by Hawaii Supreme Court Chief Justice Mark Recktenwald, who also administered the oath of office to Josh Green, a former state senator who is now lieutenant governor. Ige said his priorities include the economy, which he described as already in the process of transforming because of high technology. To ensure Hawaii’s economic transformation, the state must provide adequate, affordable housing and have an educated workforce, he said. Ige addressed the audience in the Capitol Rotunda after he was sworn in. Other issues for the Ige-Green administration include sustainability and self-sufficiency. The governor said little about specific policy proposals, explaining that he will elaborate in his State of the State address in January when the Legislature convenes. But the governor of a small state in the middle of the Pacific Ocean also has his eyes on national events. From left: former governors Neil Abercrombie and Linda Lingle, former Gov. George Ariyoshi and wife Jean Ariyoshi, former Gov. John Waihee and wife Lynne Waihee, and former Gov. Ben Cayetano and wife Vicky Cayetano. Ige also returned several times in his speech to his unity message. “I am asking that we debate openly and, yes, passionately, but with respect for each other,” he said. “Real leadership does not emanate from just one individual, but from many hands joining together. It’s really about each of us embracing the responsibility for our own fate and for our collective future. In his speech, Green identified homelessness, opioid addiction, untreated mental illness, affordable housing and “a livable wage” as his priorities as lieutenant governor. The local values of aloha and ohana, he said, would inform his work. Green, a medical doctor, said he would be exploring the possibility of free clinics and promised to get out into the community to directly engage with people in need. “This will be my mission,” he said. 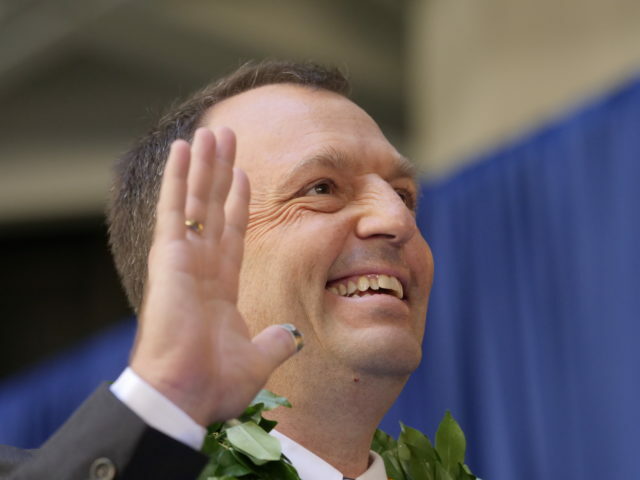 Josh Green, Hawaii’s new lieutenant governor, promised to focus on homelessness and several other issues. At a brief press conference with reporters in his fifth floor office after the inauguration, the governor did not provide financial figures for the clinics. He was also noncommittal on how much more money for education he might seek from the Legislature. But the governor did say he expected increased revenue from better tax collection would influence budget spending. And he said he was happy that his children — Lauren, Amy and Matthew — could attend the inauguration. That was not the case in 2014, as all three were attending college on the mainland. Cabinet and other staffing changes will be forthcoming, Ige said. 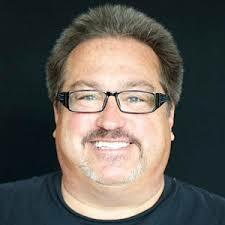 He already faces vacancies with Randy Iwase leaving his chair position on the state Public Utilities Commission and Luis Salaveria stepping down as director of the state Department of Business, Economic Development and Tourism. 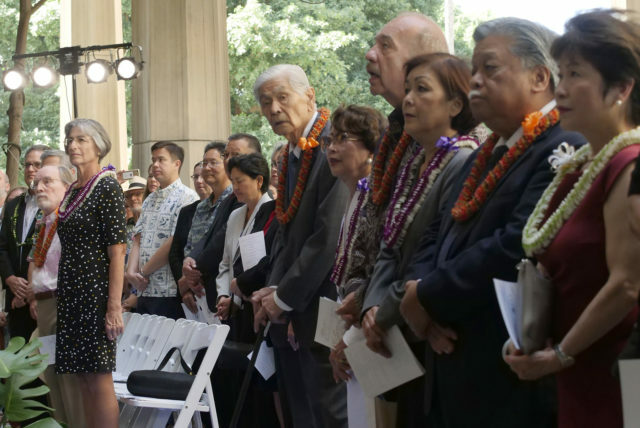 Former governors George Ariyoshi, John Waihee, Ben Cayetano, Linda Lingle and Neil Abercrombie sat in the front row of the ceremony. House Speaker Scott Saiki, Senate Majority Leader J. Kalani English, Honolulu Mayor Kirk Caldwell and U.S. Congressman-elect Ed Case were also among the dignitaries. 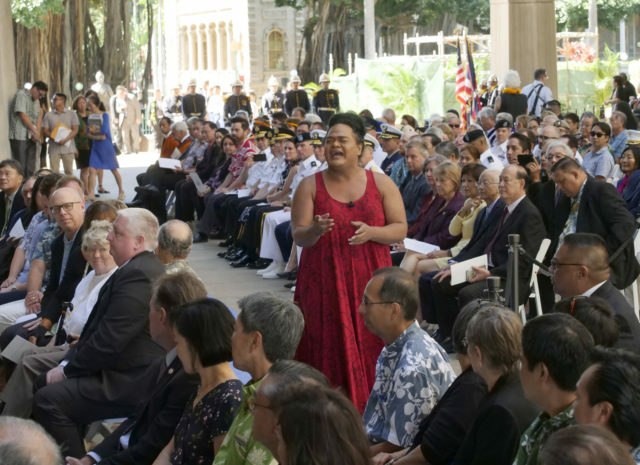 The inaugural included the singing of the national anthem and “Hawaii Ponoi,” as is customary. Danny Akaka Jr. read the Queen’s Prayer and invocation, while Bishop Eric Matsumoto gave the benediction. An oli was performed by Kaumakaiwa Kanakaole. A 19-cannon salute from the 1st Battalion, 487th Field Artillery Regiment, Hawaii Army National Guard, was so loud that some in the audience almost jumped out of their seats. A humorous moment came when emcee Ryan Kalei Tsuji, who formerly worked for Ige, asked the audience to wait patiently for two minutes until the clock struck noon. That’s because the chief justice could not legally administer the oath of office until then. 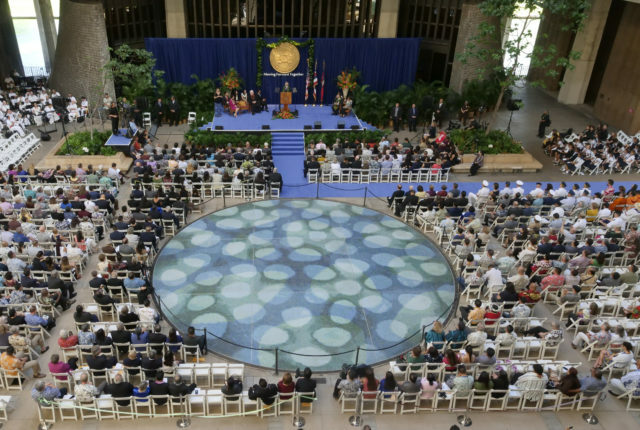 Inaugural celebrations were scheduled to continue for the governor Monday night at the Hilton Hawaiian Village Waikiki Beach Resort.